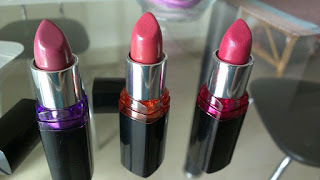 I have never had much luck with drugstore lipsticks. 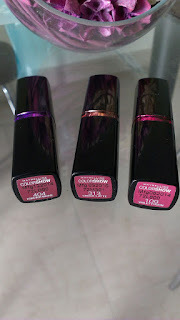 At a point, I stopped following new drugstore launches and that was until I saw swatches of Maybelline Color Show lippies. The colors looked like the ones up my alley and Maybelline had whole array of colors from brown to pinks to purples to red to choose from. 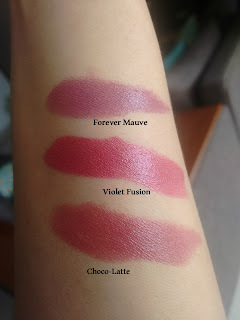 I went cray-cray and bought home 3 lippies: Choco-Latte, Violet Fusion, and Forever Mauve. Maybelline New York launches 32 new lipstick shades with the most stunning hues of red, pink, brown and mauve. 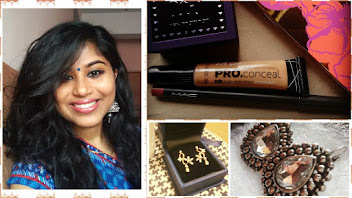 They are vibrant moisture rich shades to suit all Indian skin tones. Enriched with ultra-care hydrating formula which gives your lips all day hydration. They are anti-oxidant and and heat resistant, which guarantees color integrity and does not even fade in extreme heat and humidity. Are you ready to show off your colorful sides? A standard black packaging. The colored band around the body of the lipstick indicates the color family. For Rs.299 ($5), the packaging is OK, nothing to write home about. This is one thing, that I was disappointed about. Smells of strawberries, not in a good way though, but more leaning towards tackish. Creamy and highly pigmented, with no tugging and pulling. The color, Violet Fusion had visible silver sparkles that makes it slightly gritty. Being creamy, the colors do transfer. 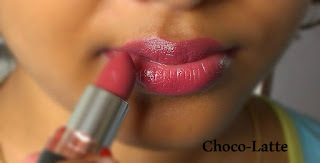 Choco-Latte (Brown Band): The perfect MLBB for tan girls,it can pull of pink or brown depending on your skin undertone. Forever Mauve (Violet Band): A pinky-purple, which leans more towards purple. The color screams sophistication, and is not a common color under drugstore color wheel. It can also make you look slightly older and mature. , that makes this lipstick look tacky. If you are in the medium-tan skin color, this is one of that hot pinks that will not clash with your skin undertone.